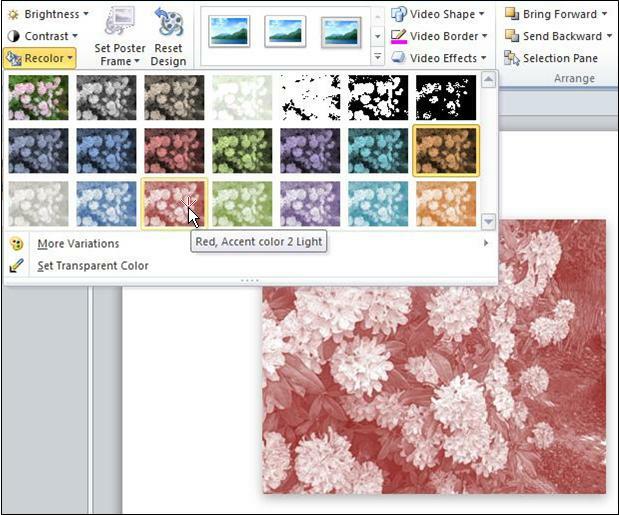 In PowerPoint, you can recolor a video on a slide by applying a built-in stylized color effect, such as a sepia tone or grayscale. On the slide, select the video that you want to recolor. On the Format tab, in the Adjust group, click Color to see the options under Recolor. Tip: If you don't see the Formattab, make sure that the video is selected. Choose from the pre-built, stylized recolor effects. To view additional colors, including variations of theme colors, standard, or custom colors, click More Variations. The recolor effect will be applied using the color variation. Tip: Move your mouse pointer over a recolor effect to get a preview of what your video would look like with that recolor effect applied to it.